I love all the little touches that a bride can do for her guests that are traveling in from out of town. A door knob hanger is a fun way to welcome your guests to town and can be left on each hotel room door or inside of the Welcome Bags/Baskets/Buckets/Boxes that you assemble for your guests. Here is a door knob hanger that I made for a bride that is having a destination wedding. I had so much fun working with her to make the door knob hanger. This design can also be carried throughout welcome gifts on things like water bottle labels, candy bar wrappers, bag toppers, gift tags, box labels and so much more! If you would like a custom door hanger or other favors for guests traveling in from out of town contact Paper Perfection at jtanddolly@yahoo.com for pricing and details. They turned out even more adorable than I could have imagined!!! Thanks again! So glad that you love the door hanger! 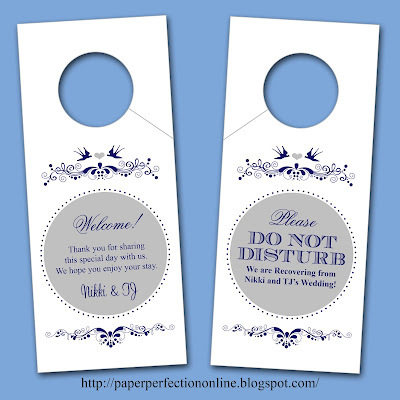 I know you will have a wonderful wedding with all of the little extra details like the door hanger that you have planned.